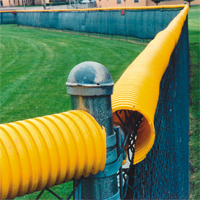 For high visibility and protection from a player injuring himself on the top of a chain link fence. Inexpensive way to beautify any field. Comes pre-slit and ready to install. Attach tie wraps every two feet to secure cap. Ties available in matching colors. Cut to length in the field.